A lost study of Buddhist art reveals a hidden side of a great literary critic. When William Empson took a job as a university lecturer in Tokyo in 1931, his star was rising. The previous year he had published his first book, Seven Types of Ambiguity. A guide to the close analysis of poems, the book upended literary criticism in Britain and would soon do so in the United States. In Japan, Empson developed a fascination with Buddhist art that grew into a monograph, The Face of the Buddha; this book, too, became famous, but for entirely different reasons. Empson worked on the project intermittently for a decade, only to discover that his sole copy of the manuscript had mysteriously disappeared, along with a collection of irreplaceable photographs assembled throughout his travels. His friend John Davenport eventually admitted to having left it in a cab. Critics have long known of the lost manuscript, but its rediscovery a few years ago was wholly unanticipated. Happily for Empson’s readers, Davenport was mistaken about what he did with the manuscript: It turns out that he gave it to the Tamil poet M.J. Tambimuttu, who in turn gave it to Richard March, his coeditor at Poetry London. March died shortly thereafter, in 1955, and the British Library didn’t purchase his papers until decades later. In 2005, a half-century after Empson had given up the manuscript for lost, a watchful curator named Jamie Andrews came across it in March’s papers and identified it as the mislaid book. Empson never claimed to have more than a serious amateur’s interest in Eastern art, but he wasn’t the sort to be deterred by a lack of expertise, having launched his career in literary criticism as the kind of amateur who gives professionals a run for their money. When he began studying 17th-century English literature at Cambridge after completing a degree in mathematics, his tutor, the formidable I.A. Richards, wrote that Empson “seemed to have read more English Literature than I had…so our roles were soon in some danger of being reversed.” The essays that Empson wrote for his undergraduate tutorials with Richards provided the kernel for Seven Types of Ambiguity, which quickly became a cornerstone of the New Criticism. 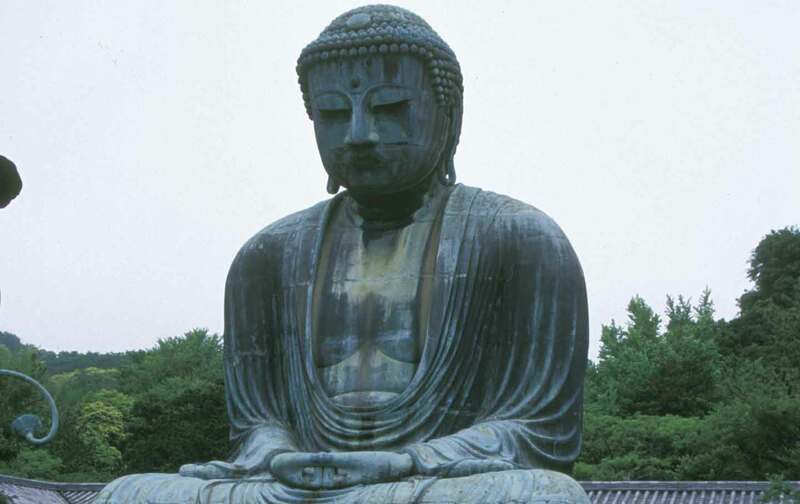 In Japan, Empson didn’t waste any time acquainting himself with Buddhist teachings and iconography, studying the origins of Buddhist art in India and tracing its spread throughout East and Southeast Asia. He borrowed the technique, then favored by psychologists studying facial expressions, of creating “split photographs”—images with a reverse-symmetrical version of the right half of a face appearing on the left side, and vice versa. He took drawing lessons to be able to make accurate sketches of the Buddhas he saw. He even developed a habit of doodling Buddhas in notebooks, perhaps in a nod to the Buddhist practice of drawing as a meditative discipline. “Even boys in their play who draw the Blessed One with their fingernails are gradually acquiring merit and becoming pitiful in heart,” reads the Lotus Sutra, in Empson’s paraphrase. Empson also learned about the psychological theories fashionable in the 1930s, which suggested that personality could be manifested in the asymmetry of human faces. However, Empson was somewhat wary of too-easy dichotomies. He distrusted theories that posited a divide between a person’s superficial personality and real self, thinking it more plausible “to say that we are made out of layers of masks like an onion, and that all the masks have got the living juice in them.” But his correspondence with an eminent psychologist further convinced him that his theory about asymmetrical Buddha faces was correct. These psychological theories have largely been discredited, making Empson’s approach seem dated. But his hypothesis is still sound, because it doesn’t depend on any particular notion of how human facial expressions reveal emotion or personality. In his preface to this edition, the distinguished art historian Partha Mitter offers the circumspect assessment that Empson’s argument “as a working hypothesis holds water though a lot more research is needed.” And even if certain statues have visibly asymmetrical features, whether Empson correctly explained this phenomenon is a different question. He was aware that parts of his theory couldn’t be proved based on the available facts. For instance, he came across fortune-tellers at Chinese fairs who read each side of the face according to different rules, and speculated that Buddhist sculptors might have been inspired by such practices. But he had to admit that he couldn’t find any evidence in writing that dated as far back as his argument required. Empson’s affinity for Buddhist sculpture was visceral: He called it “the only accessible Art I find myself able to care about.” He was certainly conversant in the history of Western art—one description of an Indian cave fresco alludes to Gauguin in the same sentence as “mellow socially glittering Venetian crowd scenes”—but it didn’t consume him as Buddhist art did. And as he learned more about Buddhism, his long-standing antipathy to Christian doctrine only heightened his interest in Eastern art. It seems more likely that what Empson found attractive about Buddhism was not its ability to “unite” action and repose, but precisely the unresolved conflict that inheres in the notion of a Buddha who “after attaining peace is still imagined as a social being.” Significantly, Empson never identified as a Buddhist. Of course, trying to figure out why an author has become more or less prolific is always a tricky enterprise, and the most inspired conjectures can seem little better than guesswork. But on the whole, it seems unlikely that Buddhist sculpture presented itself to Empson as an answer to the modern predicament. In fact, one of the best things about The Face of the Buddha is Empson’s canny descriptions of the different statues, which read like character sketches of actual humans rather than portraits of unruffled calm. Of one, he writes: “From sheer left the mouth is plaintive and even ready to squall; from half left the face has a refined, coy distaste.” Of another, a statue of a female bodhisattva, he says that the “nose seems planned to deceive. In full front face, it looks a childish tough practical blob, and belongs to the rueful, puggy, puzzled effect of her absolute and hopeless generosity…. From half side face it is straight, intellectual, and rather conscious of a bad smell. From sheer side face…it is almost gross, with a sensuality admitted but renounced and a lust for power only half satisfied by bounty.” This is hardly the stuff of peaceful withdrawal from the world. There’s a sense in which The Face of the Buddha is the antithesis of a book that Empson refused to write—a travel memoir about Asia—despite his being perfectly positioned to do so. His hunt for Buddha sculptures took him to Korea, Vietnam, Cambodia, Burma (Myanmar), India, Ceylon (Sri Lanka), and all over mainland China. The most illustrious of his literary acquaintances, as well as his predecessor in the Tokyo job, were all writing books about their Eastern travels. In 1938, Christopher Isherwood and W.H. Auden turned up in Hong Kong, where Empson ran into them. They were writing a travelogue commissioned by Faber and Random House, which would eventually appear as Journey to a War (1939). The Face of the Buddha wouldn’t exist if Empson hadn’t ended up in Japan after being expelled from Cambridge, when his private stash of condoms was discovered in his room by college porters. Maddeningly, the scandal took place only weeks after he was elected to a fellowship at Magdalene College that would have guaranteed the secure position and income (of £150 per year) he needed to write Seven Types of Ambiguity. Empson had to move into cheap living quarters in bohemian London, and the debacle meant that his chances at an academic career in England were slim. His friend Richards had accepted a visiting professorship at a top university in Beijing, and Empson longed to join him there, writing that moving to Tokyo would be “more remunerative but…much less interesting” by comparison. He took the job anyway. Chenxin JiangChenxin Jiang is a literary translator based in Chicago and Shanghai and a senior editor at Asymptote.